Establishing a successful SIAM capability requires the co-ordination of a multiple dimensions including People, Organisations, Processes, Suppliers, Governance, Contracts, Incentives and Beliefs. As such, a SIAM capability could almost define the Wikipedia entry for a Complex Adaptive System. Any change to the system will set off a chain of events as the component parts of the system react to the initial change. 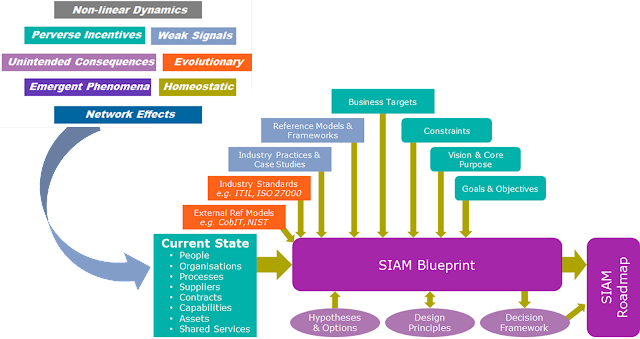 This adaptive nature creates particular challenges to designing and establishing a SIAM capability, as many of the outcomes from a change are unpredictable, and could include unintended consequences, emergent phenomena and perverse incentives. Fortunately, much progress has been made over the last thirty years in defining how best to deal with Complex Adaptive systems and these techniques must now be harnessed and applied to the SIAM domain. The most successful interventions take a whole system approach and avoid overly engineered up-front design and simplistic, reductive thinking.